HomeArticleISRO Launched 104 Satellite on Wednesday and creates a record. ISRO Launched 104 Satellite on Wednesday and creates a record. 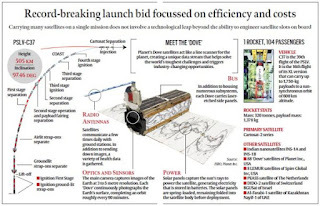 Indian Space Research Organisation (ISRO) on Wednesday set a new precedent when it comes to launching satellites. It has successfully launched the PSLV-37 rocket which put in to orbit a record 104 satellites from seven countries. Using the time-tested and popular Polar Satellite Launch Vehicle (PSLV), ISRO surpassed its personal best of sending up 20 satellites in one go. The bar, however, was previously set by Russia in 2014 when it launched 37 satellites in a single mission. Why SHAR is choosen for launch a satellite? Sriharikota is ideal for eastward launches. SHAR’s location on the east coast ensures that it gains an additional velocity of 0.4 km/s due to Earth’s rotation to easily launch rockets. Most satellites are launched eastward.